Because our family was not able to be all together on Christmas Eve or Day last year, we had a Pre-Christmas dinner to celebrate the season a bit early. Place cards included baby photos as well as an over sized chocolate chip cookie with the guest's name piped onto it with frosting. Just follow the directions on the Nestles bits package and use a large scoop to measure batter when baking cookies. I love these ideas! Using baby photos is such a fun idea, and also love the idea of the cookie, plus you can eat it later. Great idea with the cookies! What a wonderful table! I love how you used the cookies!! Thanks for sharing. Happy TTT and Merry Christmas! I love that idea. The table setting is beautiful. What a bright and beautiful holiday table -- and I LOVE your big cookie idea, and the baby pics as well. What a beautiful table setting. Thanks for sharing. Merry Christmas. Ahhh.....how festive! Cookie place cards are too cute! OMG..LOL... now you're just showin off. That table is wonderful. It's so inviting. Your table is wonderful. I love those red napkins!! Merry Christmas to you and yours and many blessings in the coming year. 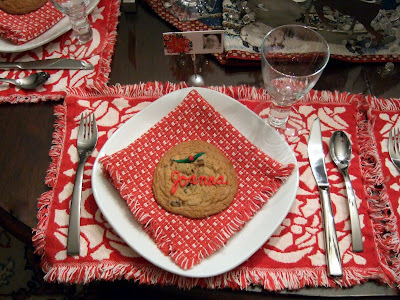 I love your wonderful Tablescape with the cookies !!! and your Beaiutiful China with the placemants and Napkins. Merry Christmas from my home to yours. May I join you--looks so festive. You could serve cardboard pizza and it would taste good at that table! Found your fun blog through blog hop! Hop blog to blog and share holiday memories!! I love this pretty tablesetting! So inviting. What a great placecard. Merry Christmas! You made a lovely tablescape for your family. Love the idea of using baby pictures. I'll have to try to remember that one. Please be sure to come by and enter my fantastic year-end giveaway. Click the picture in my sidebar for details. Blessings and a very Merry Christmas! what a gorgeous table you have set! i love the cookies with such beautiful script on them. thank you for sharing with tuesday night supper club. have a very merry christmas! Great table. Love your ideas: the cookie place card and the baby pictures. 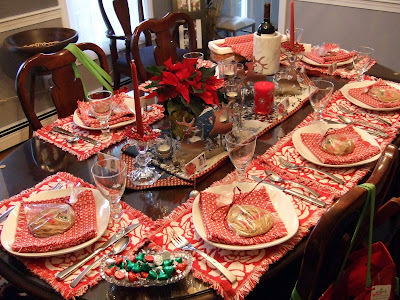 Your red and white placemats are so effective! Thanks so much for being a part of Seasonal Sundays!